Prince William and Catherine, Duchess of Cambridge attend a reception hosted by the Governor General Peter Cosgrove and Her excellency Lady Cosgrove at Government House on Day 18 of their three week tour. The Duchess' hair was pulled back into an elegant bun. Kate dazzled in a Lela Rose cocktail dress with lattice work on the sleeves and around the waist. Kate kept her jewelry simple wearing her signature Cartier watch and antique engagement ring from Prince William, which was also worn by Princess Diana. The peplum style of this dress flatters Kate's slim figure. Prince William was seen wear a tailored blue suit with a polka dotted tie. Earlier that day, Prince William signed the visitors book after touring the National Portrait Gallery. Kate is seen wearing a wardrobe staple, a green Catherine Walker coat with her favorite Sledge pumps from LK Bennett. Even the Duchess loves to touch her perfectly coiffed hair. Kate and Margaret Abbott arrive for a reception at Parliament House. Kate is given presents as she greets the public after visiting the National Portrait Gallery with Prince William. The Duchess of Cambridge and Prince William attend the Australian Parliament during their three-week tour of Australia. The happy couple is all smiles as their three-week tour winds down. A view from above! And what a view it is. Planting a tree in heels is no small feat but for the Duchess of Cambridge she makes it look easy! The royal tour is winding to a close, and today we saw two show-stopping outfits on our favorite Duchess. In the morning and early afternoon, Kate wore a blindingly bright green coatdress by Princess Diana's favorite designer, Catherine Walker. If William thought her Erdem coat was bright, we're dying to know what he thought of this one! 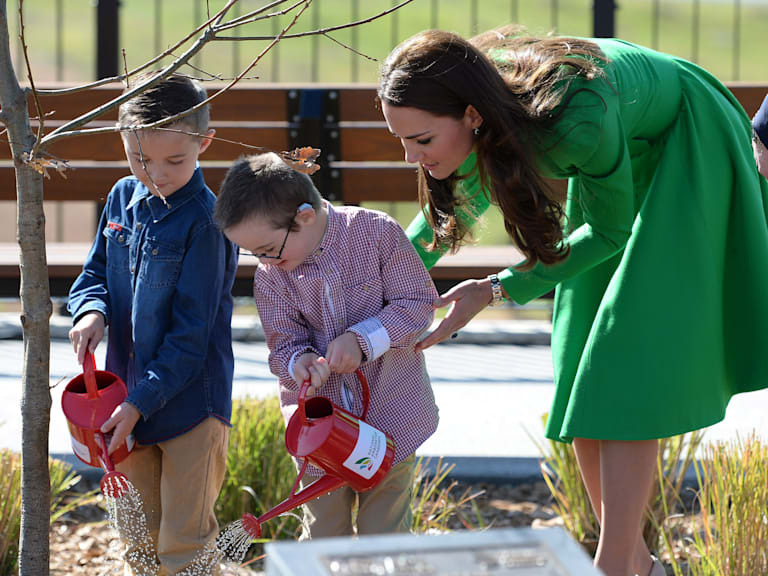 The royal couple spend the morning of their last full day of the tour with children, planting a tree and going to a playground. They then went to a reception with the Australian Prime Minister, where William spoke and gushed about their trip. Kate reportedly admitted to a guest at the reception that she was sweltering in her coat - not surprising! For an evening reception the Duchess donned a white peplum cocktail dress by Lela Rose. She wore her hair up in an elegant updo, and looked every bit the Princess (even if we were hoping for a bit more sparkle). She accessorized with black pumps and the diamond bracelet given to her by Prince Charles. Click through the gallery above to see more photos of Kate and William's 18th day of the tour.